Which Browsers do you Target for your Website Redesigns? Dr. Dave Chaffey takes an in-depth look at what browsers customers prefer, and how this can impact website redesigns and mobile optimisation. Why 'Mobile First' may be Flawed Thinking? With the clear growth in smartphone usage, there has been talk of a 'mobile first' approach to site design. Yes, I get that it's important to focus on your main audience, but there is a risk, that in some sectors, mobile users are not the most important and I've always felt that, even for business-to-consumer sites, there is a danger of 'throwing the baby out with the bathwater' if building a mobile responsive website degrades the experience or conversion rates for desktop visitors. A simplistic, tick-box we need 'mobile first, responsive web design' approach can be dangerous and more refined adaptive web design approaches may be best. We must recognise that users of desktops, tablets and mobiles are all browsing with different intentions and with different browsing time. One simple thing to consider is hover behaviour. On a desktop, you move your mouse over an element and some form of interactivity can occur. On a hand-held device this hover behaviour is the first touch. This is why many people have considered the mobile first approach and have removed any such fun from their websites. There may well be conversion issues with certain interactive elements and diminished click behaviour, but that does not mean they are not useful. A better approach is to look at the content you have and look at how best to present it. If an interactive desktop experience is thought to work best, then build that for the desktop and simplify for other devices. The downside of this is cost, since you are tailoring experience to device. But any company who is not already investing in differential, device-tailored user experiences is probably failing to maximise conversion on all devices anyway. Gone are the days when simply passing Google’s mobile optimised tests with a responsive web site are all we should do. It's also the case that, although visits by smartphones are increasing and have passed 50% in some cases, there is still a substantial volume of site users on desktop and tablet while smartphone visits aren't increasing that rapidly, particularly for some consumer applications. For Smart Insights, for example, we still have just 12.5% smartphone visitors, so a 'mobile first' approach to design wouldn't be right for us, although we're keen to build responsive versions of most page templates for these mobile readers and we think it's important for businesses to work on mobile conversion rate optimisation. Even for consumers sites, mobile may not be increasing as fast as you think. For example, this is an interesting, mainly consumer audience site, which I'm sharing since it's a UK Government consumer site for which stats are made publicly available. 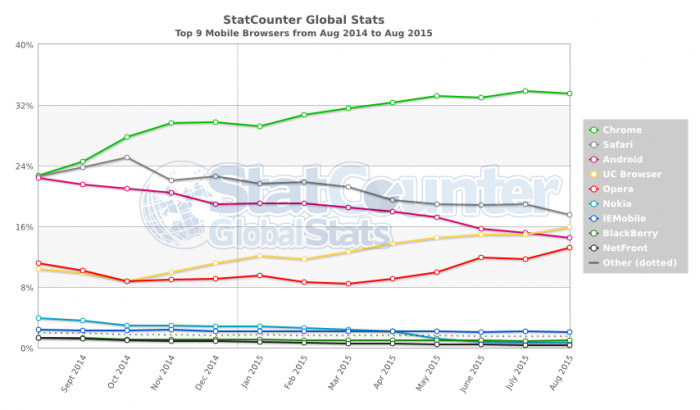 Results from this site shows that although smartphone volumes are important, they aren't rising that quickly. Although, I'm sure you'd be quick to point out that, given the choice of device for this type of application, web users would likely choose desktop first. 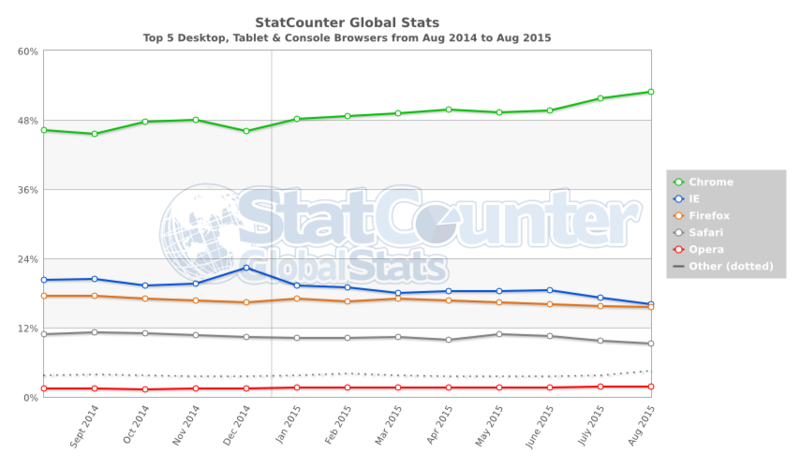 So Which Desktop Browsers Should We Target? Historically, the two main choices of benchmark stats are W3Schools Browser stats (which is skewed to developer and designer visitors) and freeware site stats tool Statcounter Global Stats (more representative since the sample exceeds 15 billion pageviews per month collected from across the StatCounter network of more than 3 million websites). Of course what really counts are the stats of the specific site you're working on optimising. With a reach of 50%, Chrome is dominant and becoming more so - a triumph for speed, usability and the reach of Google. Internet Explorer is hanging on in there given the Windows base and shouldn't be ignored with more than 20% of browser share and the challenge of older versions of IE. Firefox is at a similar level to IE, so shouldn't be ignored either. Apple's Safari is another primary target to test, but surprisingly given its importance on mobile is less than 10% overall. Despite the popularity of iOS, Chrome still rules, although as expected, Safari, the default browser on iOS, is more popular. I was interested in the popularity of Norway's Opera, which I use as a testing browser, and new to me UC Browser, which is India's top Android browser, apparently. So there you have it, you may think you know the latest tech your users are using, but check the latest situation on each site, it could have changed since you last looked at it and it still varies a lot by sector and country.